The Flash: What is The Lightning? In tonight's episode of The Flash, we got to see (for the second time, thanks to last season on Arrow) the origin of The Flash -- the moment when Barry Allen is struck by lightning, bathed in chemicals, and comes out with the ability to tap into the Speed Force and move faster than light (eventually). But...that doesn't really track, does it? I mean, lightning doesn't grant people special powers, and neither, typically, does a chemical cocktail. While in the Silver Age of comics, that was just one of those things that people accepted, more modern interpretations have taken a somewhat different approach, and we have to wonder whether they might ape that in the TV series. "I don't think that bolt of lightning struck you, Barry," Stephen Amell's Oliver Queen tells Gustin in the pilot (as we've seen in the trailers). "I think it chose you." It sounds a little...precious, except that when you stop and think about it in the context of the comics -- it totally did. 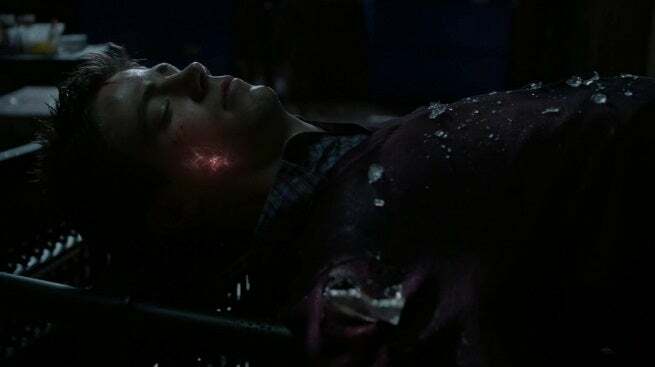 Barry Allen seemed to have "died" in Crisis on Infinite Earths, when he ran so fast that he was able to stop the Anti-Monitor’s anti-matter cannon from firing by catching the tachyon beam at the heart of the weapon and causing it to misfire. After having done this, 1988's Secret Origins Annual #2 revealed that Barry turned into a lightning bolt and traveled back in time. Yes, Barry is himself the lightning bolt that hit his lab, splashing his younger self with chemicals and transforming him into the Flash. That paradox can be a bit headache-inducing, as can more or less any time-travel story where a character deals with his own self in the past -- like the one we're seeing right now in the pages of The Flash. Anyway, whether or not Barry himself is actually the lightning bolt -- and if so, it (along with the final scene of tonight's episode) suggests that a version of the Crisis on Infinite Earths is coming to TV -- it seems likely that we'll learn eventually that it was the Speed Force, not simple lightning, that struck Barry in the pilot. Who was behind the strike, or who else might have been impacted, may be a lingering mystery of the season...!